Cabinet full of watercolor and calligraphy brushes, porcelain palettes, at Saiundo Fujimoto. While in Kyoto, I paid a visit to the shop of Saiundo Fujimoto, very well known for hand-made watercolors, and "special materials for Japanese-style painting." 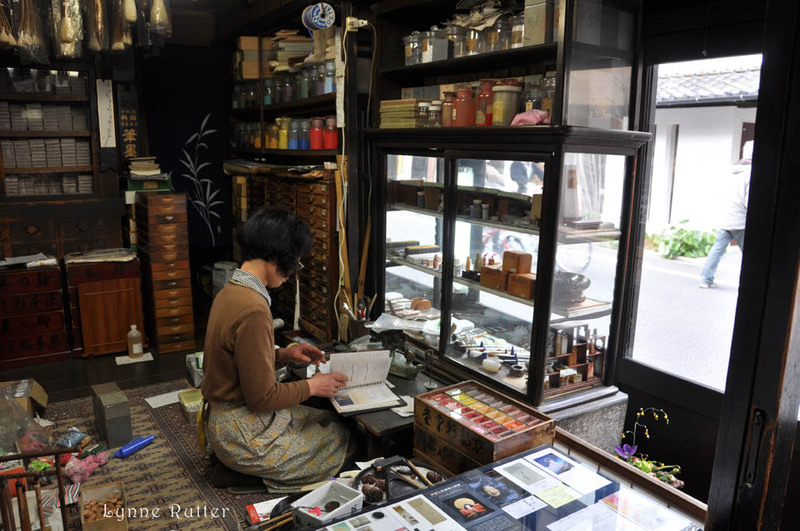 This is a lovely little shop, crammed with special brushes, paper, and supplies: glue (nikawa), chalk (gohun), and powdered mineral pigments (iwa-enogu), everything for Nihon-ga and other forms of Japanese painting. Ms Fujimoto added my card to the guest artist book. The drawers behinds her are full of bamboo handle brushes, and trays of watercolors. 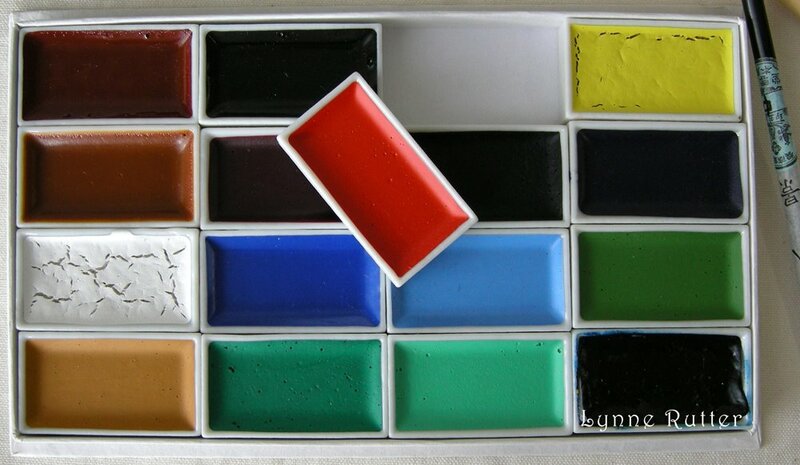 Here is my lovely new set of handmade watercolors, each in its own little ceramic tray. What a gorgeous palette, just as it is. 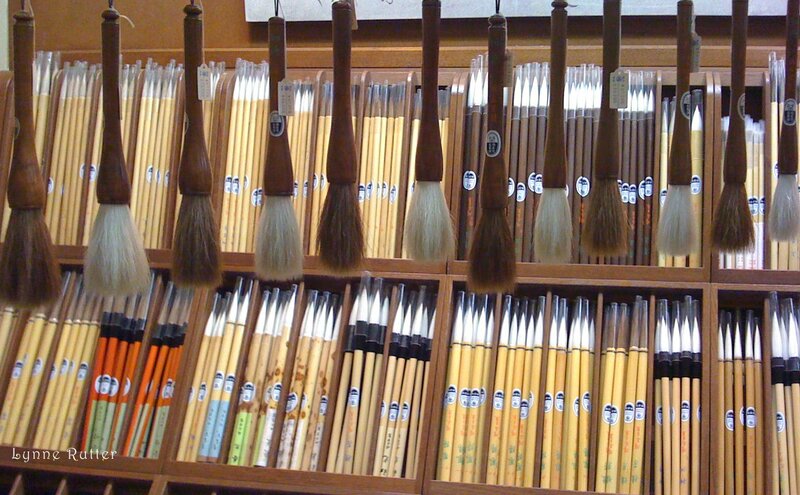 A display of sumi-e paint brushes at Kyukyodo. 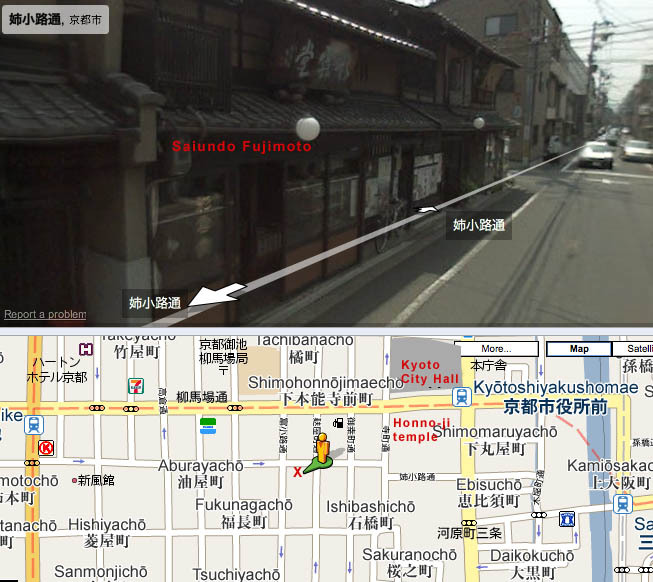 Just up the street from Saiundo Fujimoto is a wonderous store called Kyukyodo. 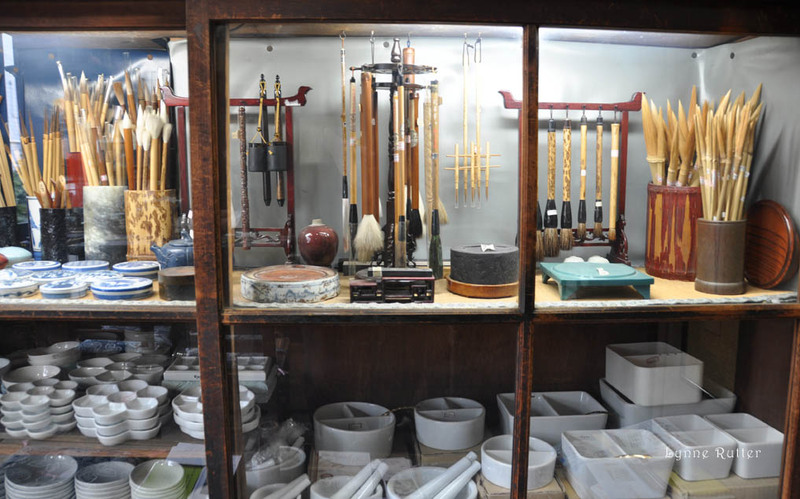 They specialize in calligraphy papers, brushes, incense, and lovely gifts. Trust me it took all of my will not to buy one of these giant sumi brushes. Neat! I love little specialty shops like this. And, that it was in a whole 'nother country is a plus, too. Oh I could easily spend a fortune in a place like that! What beautiful colours and brushes. Here is a link to an artist I absolutely love. She has a wonderful slide show explaining the process of preparing the rice paper and making the paints. 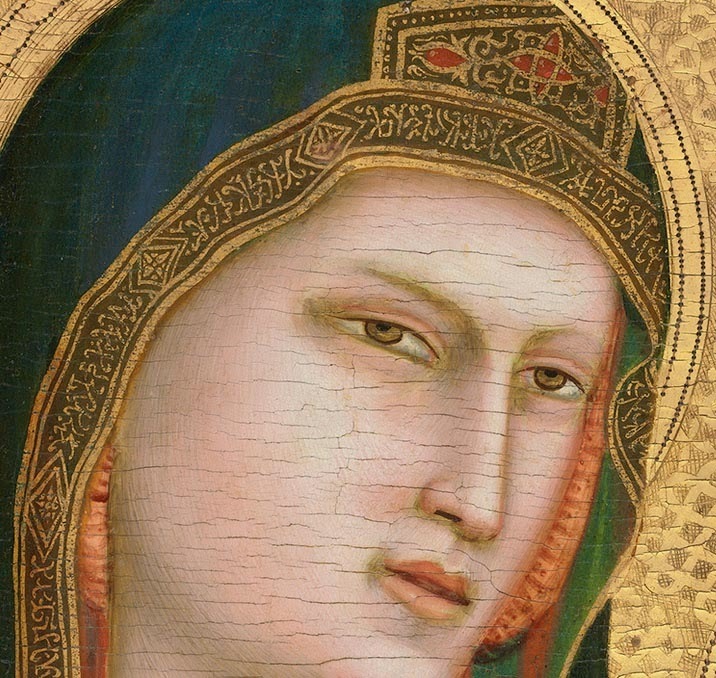 The images are beautiful and I love how she outlines each detail very simply but lovingly. The colors she uses in her paintings are so beautiful, I've only purchased prints, but I'm sure the paintings are so much more wonderful with all the textures. 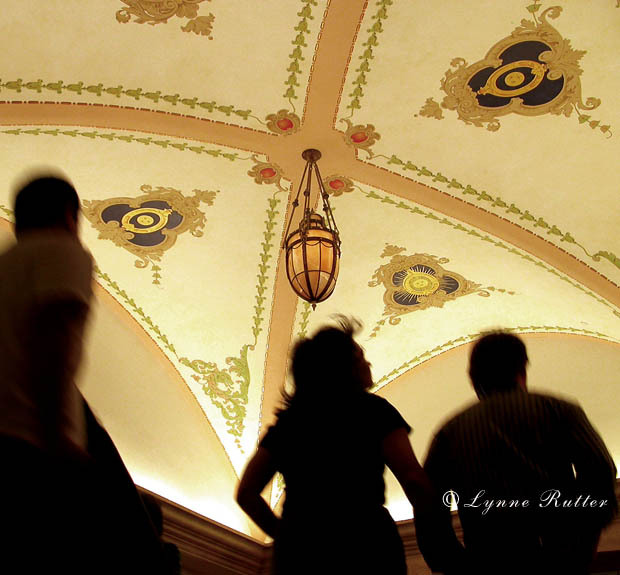 I was there and bought those amazing watercolors! But I am in the need for more! Do you know how I could buy some? ?